Sherlock (Luke Hamilton, right) and Watson (Nathan Pease, left) plot out their next move. 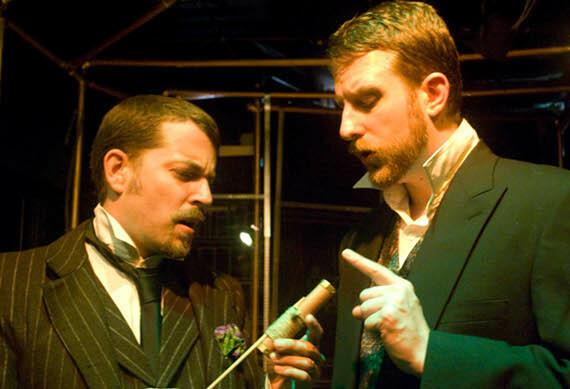 Just a short post on a great show I saw last night: Idle Muse Theatre Company’s Sherlock Holmes: The Final Adventure, currently playing at The Sideproject, is a fast-moving, plot-twisty, smart and and terribly engaging good time. Cleverly adapted for the stage by Steven Dietz from the original story by Sir Arthur Conan Doyle and William Gillette, this is a must-see for people who love the Sherlock series (I’m not among them, but enjoyed it nonetheless). While there are some mixed performances in the supporting parts, the leads are all fabulous, including Luke Hamilton in the title role and Nathan Pease as his painfully loyal partner, Dr. John H. Watson. Whip-smart dialogue between Sherlock and his archenemy Professor Moriarty as they compete in the one-up-manship Olympics boggles the mind. Plus, Steven Dietz is an interesting playwright – widely produced in regional theatres but hardly ever in New York. Trinity Rep in Providence put on a two-hander of his last year and he’s a very witty writer.